A Diamond Select Toys release! We heart Tron! 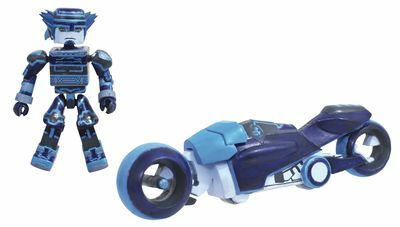 With the Space Paranoids world playing such a big role in the Kingdom Hearts video game universe, DST has made that world's Light Cycle the first deluxe vehicle in the Kingdom Hearts Minimates line! With working wheels, this approximately 6-inch long vehicle comes with an exclusive Space Paranoids Sora figure, which measures 2 inches tall with 14 points of articulation. Packaged in a full-color blister card. Designed by Barry Bradfield! Legal Notice: Entire contents trademarked (® or TM) and copyrighted (©) 1986-2019 by Things From Another World, Inc. and respective copyright and trademark holders. All rights reserved. Page rendered at 2019-04-19 02:04:41 in 0.292 seconds.